1975 Beaulieu Vineyard Cabernet Sauvignon Georges de Latour ? Proprietor Leslie Rudd’s empire of food and wine properties encompasses Dean & DeLuca, Rudd Estate in Oakville and Press, his Parisian-inspired, upscale Napa Valley bistro located in St. Helena. Sommeliers Kelli White and Scott Brenner have built what is probably the single most significant collection of California wines in United States. With their huge emphasis on classics from the 1950s, 1960s and 1970s, it is no understatement that White and Brenner have played a huge role in the massive resurgence in popularity these wines have enjoyed over the last few years. At the same time, the Press list is full of present-day icons, so there is something (many things, actually) for every palate. Readers may want to take a look at my video interview with White and Brenner for more on the list. On this evening, the food was simple, but impeccably prepared and presented. We also tasted a number of benchmark Napa Valley Cabernet Sauvignons, wines I simply adore. It was a great night of wine, food, and most importantly, camaraderie. Over the years I have been fortunate to taste many, if not most, of Philip Togni’s highly regarded Cabernet Sauvignons, but none is rarer and more coveted today than the 1969 Chappellet Cabernet Sauvignon, a wine delivers the goods, and then some. Still deeply colored, rich, powerful and intense, it will continue to thrill those lucky enough to own well-stored bottles for at least another decade. What a fabulous wine! Randy Dunn’s 1985 Cabernet Sauvignon Howell Mountain is powerful and dazzling from the very first taste. The 1985 remains unbelievably youthful, but it is firing on all cylinders today. I imagine it will still be going strong in another 20 years. Diamond Creek’s 1974 Cabernet Sauvignon Red Rock Terrace is another stunner. Full of iron, graphite and savory notes, the 1974 stands out for its superb length and fabulous overall balance. This is a terrific showing from Diamond Creek. One of the most surprising wines of the night is Don Bryant’s 1993 Cabernet Sauvignon. The 1993 won’t last forever, but it is in a gorgeous place right now. The brightness and purity of the fruit remain alluring. This is one of the all-around favorites at the table, and it is easy to see why. In a flight of wines from Heitz, the 1978 Cabernet Sauvignon Fay Vineyard impresses for its balance and harmony. Tonight it comes across as more complete than the 1973 and 1975 Martha’s Vineyard. I come back to the 1978 Fay throughout the evening and it is always superb. The 1973 Cabernet Sauvignon Martha’s Vineyard is quite pretty and powerful, but also a bit forward, while the 1975 impresses for its pure depth and richness, both remarkable for a wine that is nearly 40 years old! In any other setting, the 1973 Chappellet Cabernet Sauvignon would have probably shown better, but the table was full of great bottles, including the iconic 1969. On this night , the 1973 shows good balance, but it also comes across as a bit mature and dried out. Where to start with this superb flight of wines from Mayacamas? The 1967 Cabernet Sauvignon is laced with expressive dark red fruit that takes on exotic tones with time in the glass. It remains structured and imposing for a wine of its age. 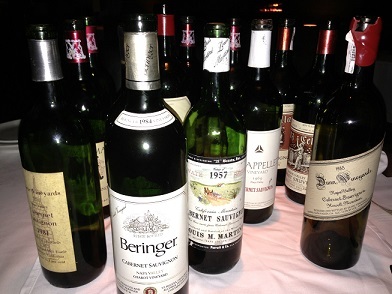 The 1969 Cabernet Sauvignon is the most forward of the wines in this grouping. Still intense, powerful and structured, the 1971 Cabernet Sauvignon dazzles for its purity and depth. This is the clear highlight in a stunning set of wines from Mayacamas. The 1973 Cabernet Sauvignon isn’t too far behind. It is a bit more immediate and juicy than the 1971, but that is not a criticism, just an observation. A deeply colored wine, the 1974 Cabernet Sauvignon exudes power and exceptional overall balance. It, too, has aged beautifully and shows no signs of fading. Tonight the 1974 is closest to the 1971 in terms of its structure and overall personality. Beaulieu Vineyard’s 1975 Cabernet Sauvignon Georges de Latour is one of the first wines that made me fall in love with Napa Valley. Alas, this is not a perfect bottle. It happens. The 1984 Cabernet Sauvignon Chabot Vineyard from Beringer is terrific. Delicate, perfumed and impeccable, it is absolutely in peak shape on this night. Another blast from the past, the 1984 Cabernet Sauvignon from Merryvale impresses for its balance and overall sense of harmony. This early effort from Bob Levy has aged impeccably. Ric Forman’s 1990 Cabernet Sauvignon is silky, polished and elegant, but not quite as thrilling as his very best wines. The 1981 Cabernet Sauvignon, one of Milt Eisele’s homemade wines, is a real treat to taste. Dark and brooding, it flows with attractive mélange of black fruit and intense ferrous notes. There is a lot to like in the 1986 Cabernet Sauvignon Hillside Select from Shafer, one of their very best early wines. Super-ripe, rich and concentrated, the 1986 shows all of the elements Shafer would go on to capture to an even greater degree in the years that would follow. On this night, the 1986 is simply drop-dead gorgeous. This early peek at Hillside Select is fascinating. I would be remiss in not mentioning Martini’s 1957 Cabernet Sauvignon Private Reserve. It appears late on this night, but the wine’s delicacy and understatement are impossible to miss. Sweet, polished and refined, the mid-weight, gracious 1957 is simply dazzling.